ArmA 3, the newest installment of the popular military simulator is set to be released on September 12. You can get your copy via digital download or as a physical box in retail locations worldwide. At release, players are going to have plenty to do with the included 12 single-player showcases, 3 faction showcases, 9 multi-player scenarios and 10 firing drills. Modders and community content creators will have access to a new island Altis, a vast terrain of over 270 km and the currently available island of Stratis, at about 20 km. 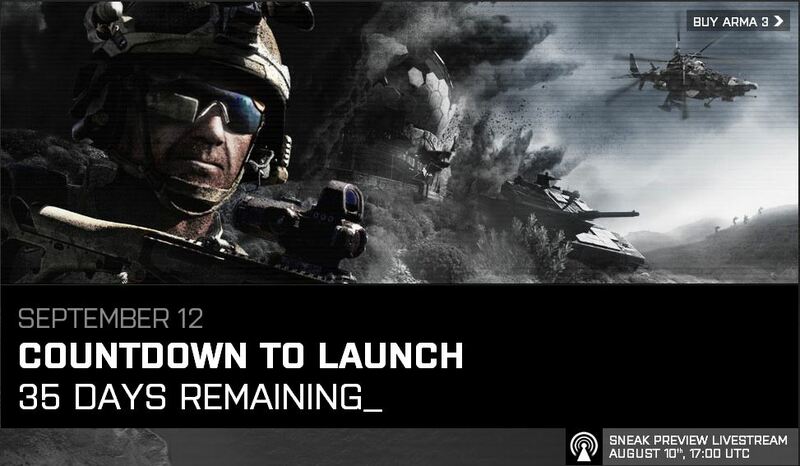 Bohemia Interactive has also announced an official campaign to be added after release via a free DLC. You can get more details about ArmA 3 and its release at the sneak preview livestream scheduled for August 10 at 5 pm UTC.